What is paramotoring like and is it really something you'll enjoy? 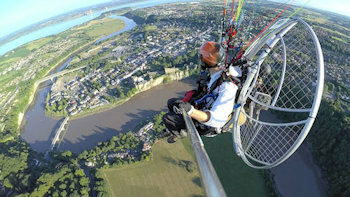 As I write this post I've just returned from an amazing flight along the Severn riverbanks. Upon returning to the field I was greeted by a crowd of people eager to know all about my flying machine. I'm always keen to post the top questions to this site, so today's topic inspired by that crowd is... What is paramotoring like? I'm about to show you exactly what paramotoring's like so you can decide whether to pursue the sport. We'll look at where you can take a paramotor, what they can do, if they're scary, if you can commute with them, and lots more. What is paramotoring like on your first solo flight? 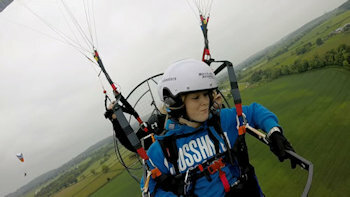 On my third day of training I was able to take my first solo paramotor flight over the beautiful Wiltshire countryside. As you can see from the picture above, all training flights are carried out with radio comms from your instructor. You will be talked through every step of the flight from launch to landing. Most people will be nervous during their first solo, and I can tell you my adrenaline was definitely pumping more than ever! I was about to launch a piece of fabric from a 50 ft hillside strapped to a nylon harness dangling from a pair of carabiners. Nevertheless, me being me, I didn't shy away from the launch, even though it felt like I was about to jump to my death. My instructor told me he likes to launch people from hills on their first few flights as it's much safer. You're straight up at altitude as soon as you leave the ground, meaning that if you get a little throttle shy you won't slam back into the deck. So the wind was perfect, I launched the wing and ran straight off the side of a hill, and I was flying! To start with I was a little nervous, I kept looking at the carabiners thinking, "I my god, they look flimsy". And I'd look up at the wing and think, "please don't collapse". You soon come to your senses and realise that you're being silly, these are all irrational fears that soon pass. You'll look down and see the ground moving beneath your feet and feel an overwhelming sense of freedom. Landing went smoothly and my instructor shook my hand, I knew this was the start of something special. You can read all about my full paramotor training experience > HERE. What is paramotoring like on your first flight without an instructor? My first flight all by myself, without an instructor took a long time to happen. I hadn't spent enough time perfecting my forward launches and I just kept failing to get airborne. So I spent every evening for about 3 months throughout the summer getting them right in a ground handling harness. Once I had them perfected I headed to the field to give it a go. The wind was pretty low but gusty, but I decided it was safe to fly. I got ready for a forward launch and felt pretty strange knowing I would be flying without any instruction from the ground. I was pretty damn nervous again but my girlfriend was there for a bit of support. Although, she did tell me she thought I'd fail the launch again, good to know she has faith in me. I kept her on the radio to let me know wind direction, change in wind speed, etc, this gave me more confidence for some reason. So I went for it, nailed the launch, and I was flying for the first time with no instructor! Being able to fly where you want, at what altitude you want, and make your own decisions is awesome. Once again I felt this amazing feeling of freedom like I've never felt before. What is paramotoring like flying cross country? In the months following those initial flights my confidence grew massively and I now have hundreds of flights behind me. For me, one of the most fun things you can do on a paramotor is cross country flying. Fly different places, see different views, and snap some epic photos. 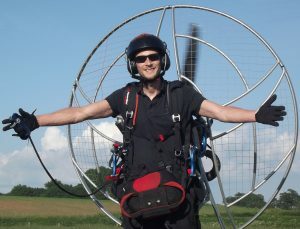 My paramotor will fly for about 3.5 hours on a tank of fuel, and depending on the wind around 90 miles. I have two launch sites about 15 miles apart, and I'm still finding new cross country flight paths to take. How cool is that? Five years of cross country flying from these two sites and I'm still not out of options. Seeing sights that you know well in a different way, from the air is so cool. You could check out well known monuments, follow winding rivers or valleys for miles, or get down low and do some hedge hopping. The possibilities really are endless. If you want to fly low like I just mentioned you should know the area very well, or check it out from altitude first. Nobody wants to fly into a power line, that wouldn't be fun! And you also need to abide by certain rules, so no low flying closer than 500 ft to people, structures, or vessels, etc. Or in certain areas, like restricted airspace, or some areas of protected land, like national parks. What is paramotoring like attending fly-ins? Paramotoring can also be a great way of meeting new people. You can get together with local pilots for a buzz around the skies, or you can attend fly-ins. You will meets hundreds of new like minded pilots, and see things you didn't think were possible. 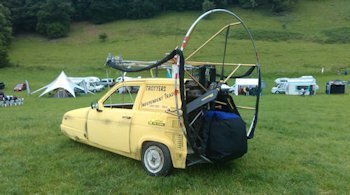 Like the flying Robin reliant pictured above that I first saw at Parafest in 2015, yes that actually flies! Fly-ins are getting more popular every year and there are now some big events you could attend. In the UK we have some great fly-ins that welcome pilots, non pilots, and anybody that's interested in paramotoring. The previously mentioned Parafest is getting bigger by the year and attracts pilots from all over. There's music, attractions, and trade stands. 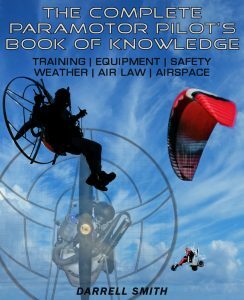 If you are curious about paramotoring this is a great way to learn everything you'd like to know about the sport. You can go along to any fly-in and talk to experienced pilots, and even get a tandem flight! What is paramotoring like doing tandem flights? Something I've not yet tried is tandem paramotoring, but my girlfriend Karen tells me it's awesome. That's Karen in the picture above taking her first tandem flight at Parafest in 2016. Tandem flying is basically the same, but the paramotor uses a bigger slower wing. The paramotor is slightly modified with lengthened bars and an extra harness that easily bolts to the original setup. 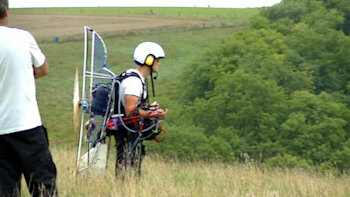 The paramotor will need a powerful engine to lift two people off the ground, and a skilled pilot to successfully launch it. 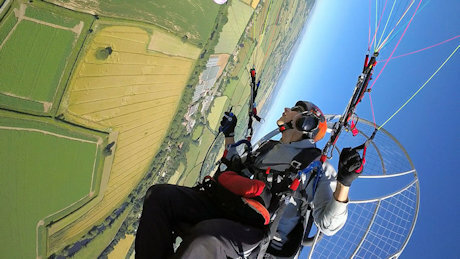 If you haven't tried paramotoring then a tandem flight is the best way to get a taste of what to expect. Then if you like it and decide to take up the sport, you could one day be the pilot carrying passengers! You can see Karen's tandem flight launch on my YouTube channel HERE. What is paramotoring like as a mode of transport? You could easily fly a paramotor to work if the weather was right, and if there's a big enough landing spot next to your workplace. But it's not something you would expect to be doing everyday. Paramotoring is very weather dependent, it's no good in winds any higher than about 15MPH, and it gets dangerous in the rain. We tend to only fly in dry, calm conditions as stronger winds make for slower air speeds. But I'm sure flying to work once in a while would be fun, and a good way of impressing the boss. A paramotor isn't really practical for transporting anything as there simply isn't enough space. The harness has small pockets that will hold cameras, wallets, phones, etc, but you wouldn't carry much shopping on one. The biggest thing I normally carry is my wings stuff-sack which just about fits under the seat. You can read about the first time I loaded up my paramotor and went camping HERE. So what is paramotoring like after five years of flying? When I started flying I'd never seen a paramotor in the flesh so I was quite shocked to find out how many local pilots there are. I've been able to meet up with these pilots to fly, and I've been to fly-ins across the country. I've created new friendships, helped people get off the ground, and discovered an amazing sport. I fly about 90 hours each year which is about the maximum you can expect in the UK. And Flying locally around Gloucestershire never gets boring, not even after five years of it! There are times that you can get stressed out, I had a spell last year where everything started to go wrong. I snapped a propeller at an un-familiar airstrip after tripping on rough ground. Then a few days later my airbox split, then a few days later I lost that brand new propeller mid air along with the whole mechanism that held it on. That was an expensive little run, but it's the first time I've had any serious problems in the whole five years. When things like that happen you just have to remember how lucky you are to have the freedom of flight. You fix the problems and then move on to even more epic flights! I've had more hobbies and interests than anybody I know, but paramotoring has to be the most amazing thing I've done so far. I love it and can't wait to see what amazing flying the future holds! Find out how to enter the wonderful world of paramotoring, and avoid lots of newbie mistakes > HERE. If you're stuck wondering what the difference is between paragliding and paramotoring GO HERE. And find out exactly how a paramotor works > HERE.